The Golaghat session court on Tuesday granted bail to five student activists, who were arrested by police for allegedlyvandalizing the Golaghat district office of BJP. The session court judge Satyajit Khound granted bail to them 14-days after the police arrested them. Mohen Bora, general secretary of All Assam Chutia Students’ Union (AACSU), Ashim Saikia, adviser of AACSU Golaghat district unit, Bidyut Saikia, general secretary ofSatra Mukti Sangram Samiti (SMSS) and Rajib Laskar, organizing secretary of Asom Jatiyatabadi Yuba Parishad (AJYP) were allowed to go on bail on surety of Rs 25000. The court also granted anticipatory bail to AJYCP member Nipon Gogoi, another accused in the case. “On perusal of the case diary, it reveals that the accused are behind the bar since January 8 in connection with Golaghat PS case no 20/19. Case diary reflects nothing for further detention of the accused persons in jail hazot (judicial custody) for the purpose of further investigation,” the court said in its order. 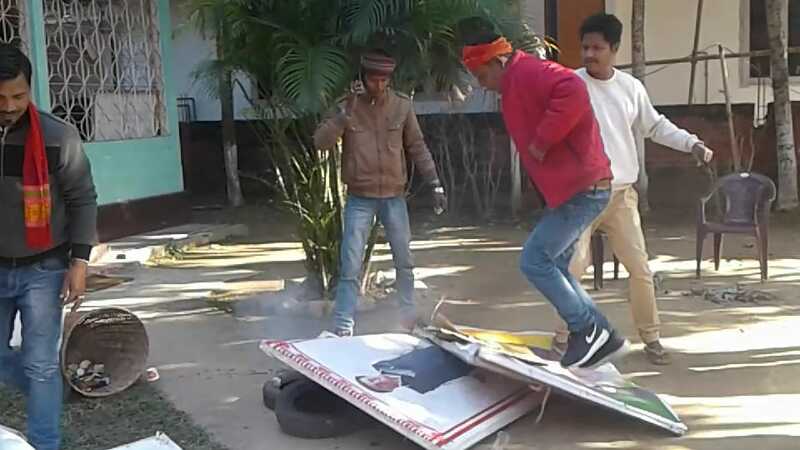 The district office of BJP was vandalized during the 11-hour general strike on January 8 called by North East Students Organisation (NESO) in protest against the Citizenship (Amendment) Bill, 2016. The office is situated at the Purona Amolapatty area in Golaghat town. The student leaders also started an indefinite hunger strike inside the Golaghat district jail demanding scrapping of the Bill and they were later shifted to Kushal Konwar Civil Hospital as the conditions of their health deteriorated.